Hot Springs is a perfect oasis for relaxing and playing during the summer! Whether you are looking for a day or two retreat or a longer vacation, there are plenty of accommodations and activities nearby. 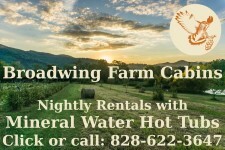 We are centrally located in the mountains of Western North Carolina and you may easily explore regional attractions within just a short drive. Hiking, fishing and boating trips are memorable on the Laurel River, a natural water amusement park just five miles from town. The Laurel’s clean, clear water is home to wild mountain trout. Approaching the French Broad River, it descends quickly over large boulders and uniquely shaped rock outcroppings. The Laurel River Trail allows you to access the rapids, deep pools, and smooth rocks for recreation. Families often spend the majority of a day sunning, swimming and picnicking on a sandy beach on the Laurel. Not only does the Appalachian Trail run right through town, there are a number of hikes you can do right from downtown. Lover’s Leap Trail follows the French Broad River and gently switchbacks up a steep ridge with stellar views of the river and valley below. The French Broad River, one of the oldest rivers in North America, flows through Hot Springs. Whitewater rafting or calm float trips are popular activities. Rafting companies will guide you down the river or equip and shuttle you for a calm float in a tube or inflatable kayak. Take a ½ day trip or stay out all day. 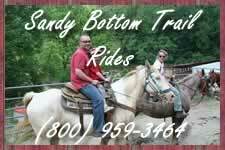 Sandy Bottom Trail Rides has over 20 horses and offers rides for all skill levels and ages. Take a 1-hour, 2-hour or 3-hour trip. Visit a garnet gem mine and keep the semi-precious stones you find. Soar through a wooded mountain forest on an exciting zipline canopy course hundreds of feet above ground. No experience necessary. The Canopy Rangers provide all needed instruction and and use state-of-the-art equipment, including helmets, full body harnesses, trolley, gloves, and tether safety lines. There are several mountain biking trails and roads for cycling in the area. Riding along the River Road to Murray Branch Recreation Area and Paint Rock is a leisurely yet scenic route.The 3.6 mile Laurel River Trail follows an old railroad grade. The Golden Ridge Trail offers several vistas from Rich Mountain along its 7.5 mile route. The Mill Ridge Trail makes a loop for four miles on old roadbed and single track. Put the bikes on the back of your car and enjoy the fun! Spring Creek flows through Hot Springs and is regularly stocked with mountain trout. Pick up a fishing license at C&H Fishing and enjoy a few quiet hours casting a line. Catch it, cook it, eat it….all in the same day. What could be better? Shopping is a treat in town. Meet the local business owners and find gifts for yourself and loved ones. Pack a picnic lunch and head off to Max Patch, the 4,629 foot bald mountain with 360-degree views as far as the eye can see. It’s an easy walk up and always 10-degrees cooler with a nice breeze. Treat yourself and the family to the hot mineral baths for a restful, rejuvenating soak in the 103-degree water. If you want to really splurge you might enjoy a foot treatment or massage. Afterwards, a trip to the ice cream shop downtown for a scoop of your favorite flavor might be in order.